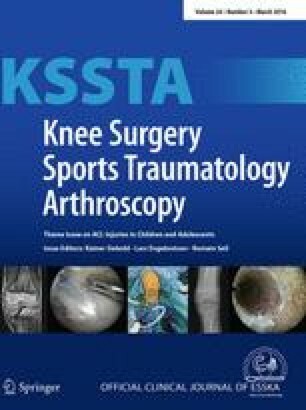 The aim of this study was to evaluate whether the anthropometric and demographic measures of patients under 18 years can be used to predict the diameter of STG autograft in ACL reconstruction surgery. Retrospective series of 169 patients under 18 years (112 men, 57 women, average age 15.8 years) underwent ACL reconstruction surgery with STG autograft. We recorded anthropometric measures (weight, height and BMI), demographics (age and gender) and autograft diameter used. Correlation coefficients, linear regression and unpaired t test were used to determine the relationship between anthropometric/demographic variables and the diameter of the graft. p values <0.05 were considered statistically significant. Correlation analysis showed a significant positive relation between height and graft diameter (r = 0.483, p < 0.0001) as well as between weight and graft diameter (r = 0.248, p = 0.001). However, age and BMI did not correlate with graft thickness (r = 0.098 and p = 0.203, r = 0.009 and p = 0.905, respectively). The mean graft diameter in men was 8.2 (range 6–10) and 7.5 in women (range 6–9), a difference that was statistically significant (p < 0.001). Prediction of the STG graft diameter according to the height of the patient is an easy and reliable method in children and adolescents. These data may provide relevant preoperative information about the need of an alternative graft source and can be useful when counselling patients. No funding was received in order to perform the present study.